Seniors Today is designed and written for the 50 plus age group and is dedicated to providing information to meet the needs of the fastest growing segment of the population! For the past 26 years, Seniors Today has been the only senior newspaper consistently published in Florida’s Volusia and Flagler counties. We constantly strive to provide information that is informative, entertaining, beneficial, and educational to our senior community. In addition to our great content, you will find recipes, puzzles, up-to-date health information, and an event page offering current activities for seniors to enjoy. 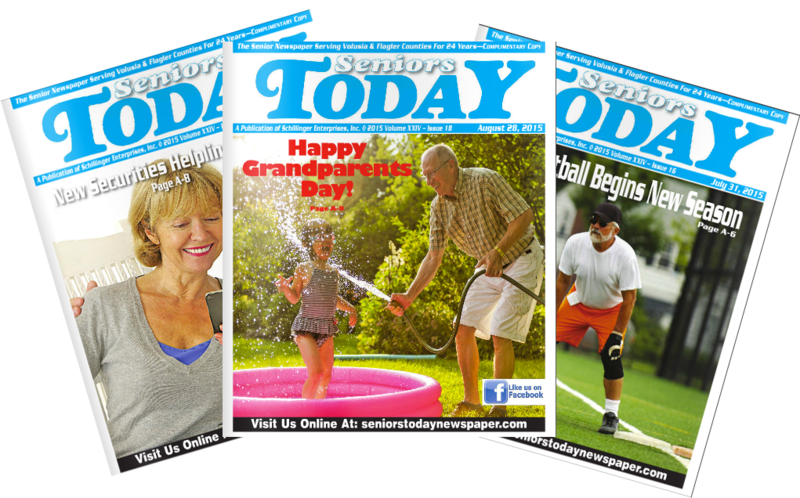 Look for your new issue of Seniors Today published every other Friday and always FREE! Our current circulation of over 25,000 copies is available in hundreds of locations throughout Volusia and Flagler counties, including; libraries, senior centers, senior communities, hospitals, Walgreens, YMCAs, condominiums, nursing homes, and assisted living facilities. Get the digital version of Seniors Today delivered to your email address every other Friday, absolutely FREE! Our bi-weekly publication features events, calendars, and interesting articles—and the entire publication can be found online.We’ve created specific pages to attract your targeted demographic. Copyright 2018 by Seniors Today Newspaper.